I had the pleasure of going to tea with a dear friend on Wednesday. The food was delicious (as it always is at the Tea Trolley in Delta, PA). We had a crustini with a sweet tomato relish, a ham with orange marmalade, and a chicken salad with grapes. The desserts were a little chocolate cup, a carrot cake, a raspberry bar, and cookie egg nest. My favorite always are the vanilla scones, with clotted cream and lemon curd. We enjoyed our time, chatting about many things going on in our lives, and enjoying the beautiful tea room, and of course the food. I'm thankful for the friends God has given me, they are the sisters I never had! My kids and Tim are big game players. I'll play some games, and I'll play in the right circumstances, but I don't like super competitive games or strategy games that people get worked up over! I do love Clue though, and when Lindsay and the girls got the game out last night, I was all in! I'm pretty good at it, I won a round last night, but I like figuring stuff out (must be all the Nancy Drew books I read as a girl!) and this is one game from my childhood I'll still play. I like Rook, and some other card games, I like to play Domino games, too. I guess I mainly like games that are not cutthroat, and that allow you to socialize while playing. Our homeschool co-op had its spring concert Friday night, and I knew you'd love to see Kamryn's class singing (she is in the blue floral dress with the coral sweater on the right). They were the Sun (Sarah) and the Moon (Kyle) in a play from Genesis 2 and 3. All the lines were scripture and it ended with the gospel. Sarah loves to sing and perform, but Kyle surprised me when he took those classes and surprised me by enjoying them! They both did very well. I had to get a picture of Birdie (my mom) and Kamryn together. They are best pals. Kayleigh bought the girls matching dresses for spring (concert and Easter) and matching shoes. Klaire did not want to stand still for a photo, she wanted to walk around with Kamryn, so I took a video! I'm going to show you some of the rearranging I've done to freshen things up in the living room for spring! The top of my mug holder looked like the perfect place for this fern, so I popped it in there and it fits just right! I did some rearranging and freshening of these shelves.They are just inside the kitchen door (that is where all that light on the left side is coming from) and hard to photograph. I like things to be pretty and functional, So I use my pretty dishes and bowls as decor! A view not often seen on the blog - from my bedroom window and the end of the house. The wood pile there feeds our campfires and bonfires, that space is buried under snow. The next two photos are from my bedroom windows that face the road. The table on the deck gives the best indication of snow accumulation. It was compacted by sleet overnight between Tuesday and Wednesday. It snowed hard all day yesterday, becoming light snow as it got dark, but even then kept on coming. I did some rearranging on my cabinet by the kitchen door yesterday. I'll show you tomorrow. I like how it looks. Its not dramatic just freshened up! Friends, Monday was a gorgeous spring day. I ran errands without a jacket of any kind; I only wore a light cardigan. It was delightful. We’d been seeing weather reports about snow but mostly this winter storms have come with a dusting or an inch or two and pretty clear roads. It stared to snow yesterday and hasn’t stopped. Its been heavy at times, but steady. We had sleet and ice overnight which is packing the snow down. The plows have been busy and the roads are passable. It’s enough of a mess though that appointments have been rescheduled and I was looking forward to tea with a friend today. Not happening. Instead I am sitting with my diffuser going and enjoying a quiet nature sounds station on Amazon Music. I've also been reading. It’ll be over tomorrow and that’s good since we have our spring co-op concert rehearsal tomorrow and the concert Friday night. "To Celebrate A Simple Life"
I love this quote by Bilbo Baggins in The Fellowship of the Ring. Of course, he's referring to Hobbits and their life in the shire. The Hobbits had no real interest in life outside shire, generally, but enjoyed their simple lives, growing things in gardens, eating many times a day, brewing ale, and smoking pipe-weed. A very simple life. In the years since we moved to Creekside Cottage, we've simplified our lives. We grew veggies, have chickens for eggs, made friends at the local produce stand, played in the creek, rode horses, did animal care, sewed skirts, pillow cases, curtains, painted walls, read books, knit, morning greeting of each family member, and hugs and kisses goodnight. A boy tucking his dad into bed every night. In years past most of our Sundays were taken up with families from church coming over to spend the afternoon. Now, we only have three families with kids/young adults still at home. Most people are older with adult children, most of whom are married and on their own now. 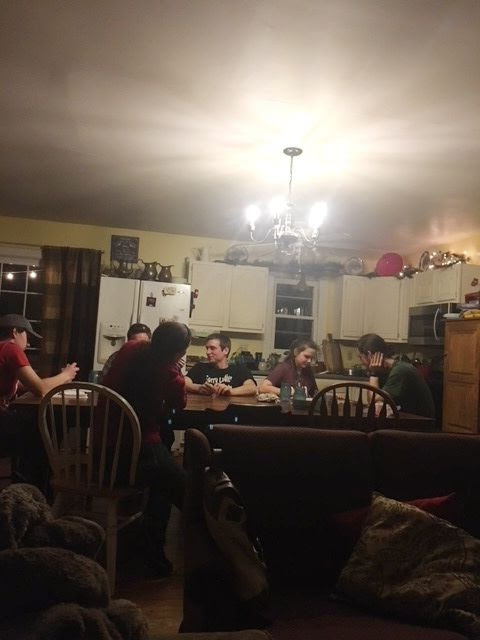 One family does come over occasionally (they have a boy Kyle's age), and the other family just the young adults come over. Tim and I are in the unique position of having kids still at home, while having married kids and grandkids. Its been an adjustment, but we really enjoy having these young adults at our house every week. Some weeks they go hiking, or they do Bible study together, but at some point they always end up at our house. There's always food involved, games or a movie or both, and lots of laughing. The main thing I like is that they are building community together. They've taken mutual interests and choose to spend this time together. I like the idea of posting Five things on Friday, so I am going to keep with it for a while. This week is all about Five things that happened since last Friday. 1. Rachel and I went to see Seussical performed by a local theater group and we enjoyed it so much! Bonus - Rachel works with the Cat in the Hat! 2. Our chickens are laying very well this year. We keep old egg cartons, so we can store the eggs easier and it makes it easier to share eggs with friends. These five dozen didn't count the eggs in a bowl on the counter. 3. Tim and I went to a company dinner with our friends' business that he does subcontracting work for. It was held at the historic Marshalton Inn. It was a lovely place, Colonial in style. Cheryl, you would love the interior of this place! 4. I got to have a fun lunch out with these people this week! They are all introverts, so I have to take photos of them before they catch me or I get the look that Tim is giving me in this photo! LOL! I need to block it and tuck all the ends in, but the blanket I've been knitting for Emma and Vinnie's baby is finished. This sweet one is due in May, and I can't wait to hold him. I used this pattern by Lion Brand Yarn, but used Studio Classics by Nicole yarn. I used by size 8 bamboo circular needles, which is a size up from the pattern, I believe. I used 3 and 1/4 skeins of yarn. It was simple to knit, and I often did it while watching a movie or reading on my Ipad. I also to pray for for the person I'm knitting for as I work on a project, so I also did that from time to time while working on this blanket. Are you working on any projects? I know you poor gals in New England are doing nothing but shoveling out from your three Nor'easters in two weeks! Spring is on the way, it really is! I babysit the girls about once a week. They arrive before 7:00 am usually, and sometimes Kamryn goes back to sleep on the couch for a while, but Klaire never does. Yesterday, they both stayed awake. Auntie Rachel left for work, but Grandpa was here for a few hours in the morning, so that was a treat! He read them a story, and we had breakfast together. After that it was bathtime (They always arrive in their jammies, and Kamryn loves a bubble bath.) Klaire is always quickly in and out, and by the time I had her dressed, I could tell she was sleepy. I was happy to hold her, and she snuggled right into me and fell asleep. Hey, its a rough grandma life, but someone has to do it! Kyle and Kamryn went out to play in our inch of snow before it all melted, and enjoyed fresh air and sunshine. Then they came in and did some schoolwork. After Klaire woke, I did a reading lesson with Kamryn, and then she did a few pages in a BrainQuest workbook.